Bizarre hats made out of wooden planks, models with ‘blacked out’ faces, and some ankle swinging sportswear were among some of the truly outlandish designs which kicked off Men’s fashion week. As models dressed in outlandish outfits stalked the catwalk, British Fashion Council member David Gandy said he wants to make London the menswear capital of the world. 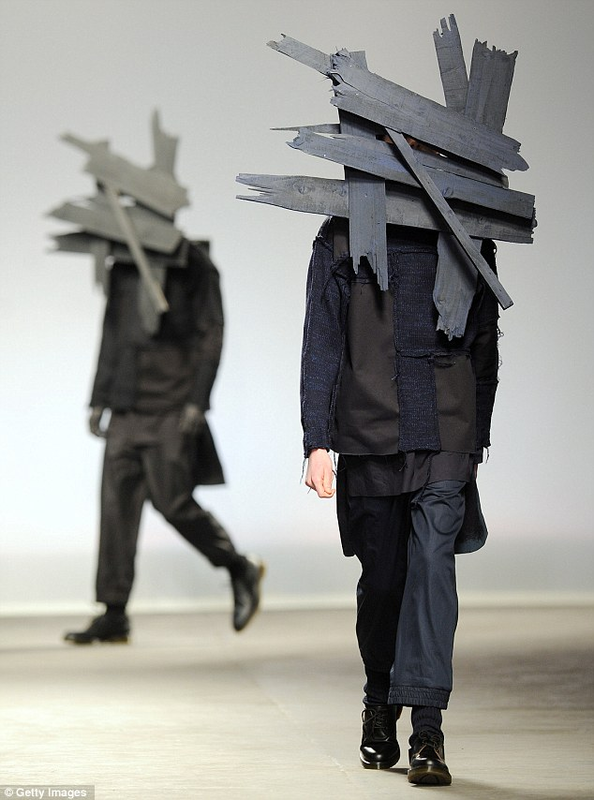 While the day started sensibly enough, withRoyal College Of Art graduate Lou Dalton’s collection featuring boiled wool and tartan trousers, things took a slightly odd turn when models dressed in dark workhouse greys paraded down the catwalk wearing hats and bizarre facial contraptions made of splintered planks of wood. Goodwell on stand- by as second hand clothing could provide houses for the homeless. This entry was posted on January 8, 2013 at 4:20 am and is filed under Uncategorized. You can follow any responses to this entry through the RSS 2.0 feed. You can leave a response, or trackback from your own site.